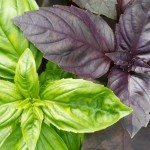 I have always had a problem growing basil, different varieties. I usually buy plants and within a few days all of the leaves are eaten, at least they look like they are eaten. They're all shriveled up. I don't see anything on the leaves and nothing else in the garden is eaten.